And now that we have heard from both managers we will leave it there. Thank you for joining us and for all your comments and votes. So Liverpool win for the second time this season, but for Bournemouth it is another disappointment. Until next time, bye for now. Fancy a bit more live football action? Why not click here for the closing stages of Barcelona v Athletic Bilbao in the Spanish Super Cup. Barca are in trouble. It is 1-1, and they trail 5-1 on aggregate. We have been running a vote throughout the evening and we asked you who will be the top goalscorer in this season's Premier League. And the result is an emphatic one. Manchester City striker Sergio Aguero picked up a huge 64.2% of the vote. Next up were Christian Benteke (10.9%), Alexis Sanchez (5.6%), Romelu Lukaku (4.7%), Wayne Rooney (3.3%), Harry Kane (3%) and Diego Costa (2.8%). The rest (5.5%) went for the 'other' option. More from Liverpool boss Brendan Rodgers. He tells Sky Sports: "We said it would be a tough game. Defensively we were very good. Our play was better after the goal, I am very pleased. "I haven't seen the replay, but it is a goal. The interpretation of offside changes every season, so it is difficult. If you are offside you are offside. "Christian Benteke gives us other options, his hold-up play was excellent. When the ball comes into the box he is a real threat and handful. He deserved his goal. "I'm very pleased for the players, six points, two clean sheets and the team will grow. A glut of new players finding their feet." Liverpool boss Brendan Rodgers on BBC Sport : "I am very confident Eddie will do well at Bournemouth and keep then in the league. "I haven't seen their disallowed goal or ours and the most important thing is ours stood. "Christian Benteke is bedding into a new team but you could see his threat." So Manchester City lead the way after two games, but Liverpool, despite only scoring two goals this season, are now third. Bournemouth boss Eddie Howe on BBC Sport: It is tough to take but we have to. We are learning tough lessons, the margins for success are small. It will be character building. "I didn't say a lot to the officials. They have a hard job but I will speak to then privately. I want feedback on the decisions." Bournemouth defender Tommy Elphick, who had a goal disallowed, was unhappy the decision went against his side. He believes the officials also made an error in giving Christian Benteke's goal when Philippe Coutinho was in an offside position. "It is really frustrating," Elphick tells Sky Sports. "I wouldn't like to be doing the referee's job. I got up ahead of him (Dejan Lovren), obviously you have to use your arms as leverage. "But their goal was the real gut-wrencher. We pride ourselves on our back line. We have been briefed all summer about the offside rule. I was in the left-back position and could see across the line so it is really frustrating. Coutinho was past our line and tried to get the ball." Both sides have their next matches away in London, with Bournemouth facing West Ham at Upton Park on Saturday, before Liverpool meet Arsenal at Emirates Stadium next Monday. Bournemouth manager Eddie Howe on Sky Sports: "It is hugely frustrating. We were in the game, the big decisions have gone against us. The first was a goal by Tommy. If that is a free-kick then we will see free-kicks every time there is a corner. "The new offside rule is a grey area. Under the new rules that is clearly offside. Our goalkeeper was affected by the player in front of him. "We had a few chances tonight but the big positive is overall our performance. We know if we perform like that the results and goals will come. The players are winners and this is an experience we don't want to get used to. "I am very proud of the performance and the players. You can't beat the decisions and the two big ones have cost us points. It is unforgiving." Christopher Nash: Refereeing costing us this game at the moment - Bournemouth were playing brilliant until the very dodgy goal. MadForChrist: Bournemouth were robbed that goal shouldn't have stood but anyway kudos to Bournemouth they never made the game boring. Eston Kimaswoch: On this, Liverpool are still so far off the mark, Top-four finish will be a miracle if not a mirage. BR has no game plan. Paul Humphreys: Coutinho definitely offside, Liverpool not impressive at all, very lucky to have won both games. Should have lost 1-0 tonight. Christian Benteke on Sky Sports: "A good debut for myself but the most important thing is the goal. The more important thing is the clean sheet." Former England midfielder Jermaine Jenas has given his view. Liverpool midfielder James Milner on Sky Sports: "We know there is a lot of room for improvement, players have come in and it will take time. We can't ask for more than six points out of six. "Philippe Coutinho has time to improve and he is a top player already. He is so difficult to mark. "Arsenal next will be a tough match, they are a quality team." Bournemouth fans – are you concerned? So played two, won two, goals scored two, goals conceded none. They made hard work of it at times, but it is a perfect, if uninspiring, start from Liverpool. Gee Em: Ball movement is just too slow, and that looks like the plan from Rodgers. Benteke is a lot quicker than BR seems to think. Over in Spain, Barcelona have finally managed to make a breakthrough in the Super Cup second leg againt Athletic Bilbao, Lionel Messi firing in just before the break from close range. Three more goals needed to level the tie. Is the comeback on? Follow the action in our dedicated live text commentary here. All you can say is good start for Liverpool. Two clean sheets, like Manchester United. Liverpool do enough to take all three points. It was a great effort from Bournemouth but they just lacked that cutting edge to force an equaliser. It was a dangerous position. But Liverpool completely mess it up. A training ground routine gone horribly wrong ends with James Milner shooting well off target. We said Moreno would tighten things up. But a jinking run to the edge of Bournemouth's penalty area is brought to a halt by Steve Cook's challenge. Free-kick. Dangerous position. It should be game over. A low cross from the right wing, finds Christian Benteke in the penalty area. He scuffs his shot down into the ground and it bounces back up to hit the crossbar. The game is still alive. Just. Four minutes of injury time. There will be plenty of positives for Bournemouth boss Eddie Howe to take. But it is points that he wants. And time is running out. Liverpool's Nathaniel Clyne has a tester at goal. But slides it well wide. A rare attack from the hosts recently. Bournemouth continue to push for an equaliser. Dan Gosling comes on for Eunan O'Kane. Will the former Everton man break Liverpool hearts? The ball is on the top of the net, not in it. Lee Tomlin's header is just over as Liverpool goalkeeper Simon Mignolet flaps as a corner. Philippe Coutinho has been trying to make things happen all evening - look at the forward passes on the graphic below. He may not be Ibrahim's cup of tea (see 76 mins) but Philippe Coutinho gets a standing ovation from the home fans as he is withdrawn as Liverpool look to hold on to the three points. Alberto Moreno is the man who has come on to tighten things up. Ten minutes left. Can Bournemouth get the equaliser their second-half play has deserved? One more change for the Cherries. Adam Smith comes on for Max Gradel, with Matt Ritchie moving to the left wing. If you are Bournemouth, you might as well throw another forward on. You might as well lose 2-0 going for a 1-1. Bournemouth's Matt Ritchie is the next man cautioned. It is a clumsy, but not malicious, foul on Liverpool substitute Emre Can and Ritchie, who earlier hit the post, will have to be careful for the last 14 minutes. Bournemouth substitute Lee Tomlin then joins Ritchie in the book for pulling back Adam Lallana. Ibrahim Rashid: Coutiniho proving he is not world class has been abject all game liverpool will definitely not make top 4. Ewan Clark: Liverpool don't look like they have anything special about them just lucking results at the moment. David D: Even as a Liverpool fan, some of the decisions against Bournemouth have been very harsh. You sure about that Ibrahim? Coutinho looks pretty impressive to me. Wonderful defending from Bournemouth's Charlie Daniels. A counter-attack sees Christian Benteke release Philippe Coutinho but the Brazilian's well-struck shot is bravely blocked by Daniels who threw himself in front of the ball. Liverpool's Joe Gomez then gets his name taken and is yellow carded for a foul. Callum Wilson looks as though his legs have gone a little bit. 'Get chalk on your boots son' - obviously the pre-match instruction to Liverpool winger Jordon Ibe - as his pass graphic shows below. Time for another Liverpool change and £29m signing Roberto Firmino, who was a late substitute in their win at Stoke last Sunday, is again given a bit of time to impress. Jordon Ibe is the man replaced. The Anfield crowd gives a loud cheer as Firmino becomes the fifth man to make his home debut tonight. He has slotted in on the right wing, but looks to have freedom to move about. Naftal Haggai: Can't see Liverpool finishing in the top four though they will come close. Saqib rao: Bournemouth are playing like they have been in the PL for a few good years- reminds me of when Swansea entered the PL stage. Jarvis Whiteley: Bournemouth don't look like a team that have just got their first taste of the PL, too early to hope they stay up. Matt Ritchie's shoot-on-sight policy sees another shot take a deflection for a corner. Ritchie's inswinging corner is pushed to safety by Mignolet, who then holds the ball well from Charlie Daniels's fierce cross. It is all Bournemouth at the moment. Worrying times for the Liverpool fans. And it is another lovely Bournemouth move. Callum Wilson plays an intelligent pass to nutmeg Dejan Lovren in the penalty area for the onrushing Eunan O'Kane. But, from a tight angle, O'Kane can only shoot into the side netting. So close from Matt Ritchie - striking the post earlier - after a decent move down the left. I was expecting to see the net bulge, that was hit with venom. So, so close to an equaliser. There seems to be little danger when a square pass finds Matt Ritchie, who comes off the right wing to blast the ball left-footed towards goal. And what a strike it is from 25 yards. Simon Mignolet is beaten but the ball bounces off his left-hand post and Liverpool survive. Alex White: Henderson the new Steven Gerrard? No chance. Gerrard was World Class by 25. Henderson never will be. sViera: Firmino on for Lallana, please. His slip at the corner sums up his match so far. Lallana fell over before taking a corner, if you wondered. After some uncertain defending from Liverpool left-back Joe Gomez, who twice fails to clear, Matt Ritchie swings a cross into the box left-footed from the right wing. But it is decisive goalkeeping from Simon Mignolet who comes off his line to punch the ball away. After good work from Christian Benteke, he finds Jordon Ibe, whose low cross falls at the feet of James Milner. But the England midfielder, acting as Liverpool captain on his home debut, cannot get the ball from under his feet quickly enough and scoops the ball wide. Srollo: Think Liverpool look good this season. Can see them finishing fifth and have a decent cup run...ie no better than last season. There's obviously a problem with Henderson. But a big moment for Milner...captaining Liverpool in his first home league game for them." Jordan Henderson had more touches than any other player while on the field. A lively start to the second half. Philippe Coutinho's shot is deflected wide, but then a forced change for the hosts. Jordan Henderson comes off for Emre Can, with the German slotting into midfield. Vice-captain James Milner now has the armband. We had not mentioned Matt Ritchie much in the first half, but the midfielder, who bagged 15 goals last season in the Championship, has another attempt at goal. Again he moves the ball on to his left foot but his curling effort is harmlessly off target. Matt Ritchie drags the ball on to his left foot and blasts a low attempt at goal but Simon Mignolet is well positioned to fall on the ball and take the sting out of the shot. Just like in the first half, a bright start to the half from Eddie Howe's side. It is as you were for Bournemouth. They stick with a 4-4-2 formation. The players are back out on the pitch and it is time for the second half. Don't go anywhere. It could be a lively 45 minutes. Can Bournemouth rescue a point? Can they get an unlikely victory? It is time for the customary 'James Milner has a great engine post'. Well, he has run further than any other player in the first half of this match at 5.87km. Is there a more under-appreciated player in the Premier League? Stoney: It's a shame when the decisions of officials rather than the ability of the players has the most influence on a match. James Rimmer: It's going to be very hard for Bournemouth to stay up unfortunately. Tom Swain: Strike me down for being positive, but I'm quite enjoying watching Liverpool play here. It is a great start to the season from the north-west teams in the Premier League, if this score stays the same. But it could get even better for Liverpool. A three-goal winning margin takes the Reds second, but they need to score another five to go top. For what it is worth after two matches. Which is not much. "Plenty for Bournemouth to take from that first 45 minutes despite being behind - but Liverpool grew into the game as the half went on and now Cherries' boss Eddie Howe must get his players to recapture that early mood. "Just the start Christian Benteke would have wanted on his Anfield debut but the goal should not have stood." Jordan Henderson is very much becoming Liverpool's midfield dictator. He has made 32 passes, with an accuracy of 84.4%, including the assist for the only goal. The new Stevie G? Former Liverpool defender Mark Lawrenson: "Eddie Howe has to forget about the goal that wasn't - he will be much aggrieved and will probably say so later. Bournemouth lost a goal because of a lack of concentration. Otherwise they have given as good as they have got." So a home debut goal at the Kop end for Christian Benteke gives Liverpool a half-time lead. But it is harsh on an adventurous Bournemouth side, who will feel aggrieved to have had Tommy Elphick's header ruled out when the game was goalless. Coutinho should have scored, a player of his ability. You could see what he was trying to do but got it horribly wrong." Philippe Coutinho's passing has been sublime in the first half. His finishing, less so. He has a half-chance but he drags a left-footed effort wide of the post. Bournemouth's back four is the same defence that played in the Cherries' last game in League One two seasons ago. Their opponents that day? Tranmere Rovers. Two promotions for Bournemouth and two relegations for Tranmere since then. Greg Matthews : Knew this new offside rule would cause havoc with officials. They couldn't cope with old one, let alone further changes. Poor. Shane Daly: There should be a rule that ref's can be changed at half-time. This is woeful refereeing, how many more mistakes will he make. Peter Conlan: What a bad way to introduce that new offside rule. Typical Liverpool, should be one behind, now one in front! Down 4-0 after the first leg after a humiliating defeat, not many people would be confident of turning it around. But, then again, Barcelona are no normal team. They were thrashed by Athletic Bilbao in the first leg of the Spanish Super Cup with the second leg at the Nou Camp starting at 21:00 BST. "We know it's a challenge, but I think we've a team who can do it," said Barca boss Luis Enrique. "If we get things right, we can turn things around. Everyone knows Barcelona is capable of anything." Follow our live text commentary of that match here. First booking of the day goes to Bournemouth's Eunan O'Kane for running across Philippe Coutinho and bringing the Brazilian down. Liverpool then waste the free-kick. Jordan Henderson has 10 assists in the Premier League since the start of last season; more than any other English player. Ash: Liverpool fan but that looked offside to me. Giannina Caraceni: Can the records show that Liverpool fans acknowledge the dreadful refereeing in the game so far? Niklas Lanwehr: Looks like the linesman didn't listen too carefully when the new rules were explained, obvious active movement from Coutinho. "Bournemouth will be feeling a real sense of injustice here. The decision to rule out Tommy Elphick's header for a foul on Dejan Lovren was very debatable - and surely Philippe Coutinho was offside, even stretching to try and touch Jordan Henderson's cross. "Manager Eddie Howe is in deep discussion with the fourth official and he has got plenty to talk to him about." That was Benteke's 50th goal for English clubs and he has scored 12 goals in his last 13 Premier League appearances. Key: 14 - Jordan Henderson, 2 - Nathaniel Clyne, 9 - Christian Benteke. Former Liverpool defender Mark Lawrenson: "That's the first mistake Bournemouth have made. They stood in the line as the ball came in. My first thought was Benteke off side? He wasn't. It almost came off his studs and he did well because it was going quite high." Nearly two goals in three minutes for Liverpool. Jordan Henderson is found 25 yards out and hits a dipping shot first time. But he is just a bit too far out and the ball bounces off the top of the crossbar. Liverpool lead. But there is controversy at Anfield as Philippe Coutinho is standing well offside as the ball comes in from Jordan Henderson on the left wing. Coutinho motions towards the ball, and should be classed as offside, but the ball bounces past him and Christian Benteke, who was onside, prods it into the net from three yards out. What a home debut for Benteke. A goal inside the first half-hour. A moment the big striker will never forget. The television cameras have just picked out Liverpool striker Mario Balotelli in a suit looking thoroughly miserable. He has a huge earring on and a crazy spikey haircut. Loose play from Bournemouth's Matt Ritchie, who gifts the ball to Christian Benteke. The striker hits his effort with pace, but it goes over the bar from 20 yards out. Who's in Anfield's VIP seats? Not sure he will be clapping after Liverpool's first 20 minutes. That looks like red-faced Kenny Dalglish in the background. A hand up in apology from Jordon Ibe as he fails to control yet another magnificent long-range pass from Philippe Coutinho. The ball dribbles harmlessly out of play when the pass deserved much more. 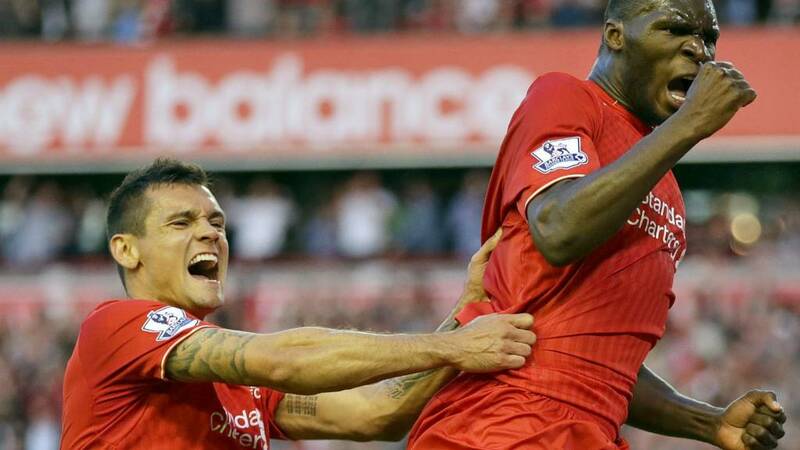 Not quite the start Christian Benteke was looking for on his home Liverpool debut. He has been tidy enough when in possession but, as the pass graphic shows below (red means an unsuccessful pass), he hasn't had the ball where he wants. William Swayne: Liverpool's passing is just unbelievably bad. John Wilde: Welcome to the Premier League Bournemouth! Harsh decisions going against you when playing the supposed 'bigger teams'. Dave More: Bournemouth, like Barcelona, pressing the ball, hunting it back, forcing Liverpool into silly mistakes. We have not seen much of Christian Benteke so far but the Belgium international only just misses getting on the end of a wonderful ball from the halfway line by Philippe Coutinho. Luckily for Bournemouth, Artur Boruc was off his line quickly to gather the ball before Benteke. Quarter of an hour gone and I can't remember Liverpool getting the ball down and playing three or four passes. I think they have been surprised by Bournemouth's intensity." Lovely link-up play between James Milner, Nathaniel Clyne and Philippe Coutinho gets a warm round of applause from the Liverpool fans. But Clyne's cross does not make it past the first man at the near post and the chance is gone. They keep showing replays of the Bournemouth goal that was chalked off. That is so not a foul at all. The referee was in a fantastic position as well." Bournemouth's Josh King gets his head to a set-piece, but can only steer it over the bar. A very bright start for Eddie Howe's side. "Bournemouth have made a very confident start and the early signs are manager Eddie Howe has told his players to prey on the vulnerability of Dejan Lovren - and the Croatian has made an uncertain start. The Cherries have not stood back and wondered, they are having a go." Referee Craig Pawson's decision to rule out Tommy Elphick's header that would have given Bournemouth an early lead has not gone down well with you. Cameron Laws: So that's a foul but Skrtel doing worse than that at every single corner isn't? Terrible decision. James Hammond: Serious heart-in-mouth moment there! Richard: That's so, so soft from the referee. Bournemouth unlucky, already. The Bournemouth fans are loving every minute of this. And rightly so. Every touch from a visiting player gets an 'ole' shout from the travelling support. This was not in the script. Sam Unsworth : I really hope Bournemouth do the south proud. I'm a Saints fan but hope Howe and Co destroy Brendan and half of the ex-saints squad. The referee blew very, very early. It's a goal, he just about brushed against him at most. That's a massive call." Harsh. Very harsh. The corner comes in from the right wing and Bournemouth's Tommy Elphick rises above Dejan Lovren to head the ball into the net from six yards out. Referee Craig Pawson rules Elphick had fouled the home defender, but there seemed to be little in it. It already has the look of an entertaining, open game. Jordon Ibe flashes one wide at one end, and Callum Wilson wins Bournemouth a corner at the other. Bournemouth are playing two up front which is brave. Let's see if their bravery is rewarded." We have talked about what a day it is for the Bournemouth players and manager Eddie Howe. And what a moment for this man too. This is Jeff Mostyn- the man who took over Bournemouth as they battled to stay in the football league, tonight he sits in the directors box at Anfield for his side's first Premier League away day. A bright start from the visitors as left-back Charlie Daniels is allowed space to gallop forward and his low cross, aiming for Callum Wilson, leads to a desperate lunge from Martin Skrtel. He sends it for a corner, which Bournemouth waste. Former Liverpool defender Mark Lawrenson on BBC Radio 5 live: "After losing their first game Bournemouth won't want to come here playing open expansive football. They can't treat this like any other game. They're in the Premier League. Everyone saw how nuts they went when they got in the Premier League." The Bournemouth players pose for a squad picture at the start of the match. Sort of how teams do at the start of an international match. BBC Radio 5 live's Mark Lawrenson says he has never seen it before at a Premier League match. Paul Humphreys : Liverpool have a very brittle midfield, if Bournemouth go for it they could have a lot of joy. John Pierce :I have to say Benteke is decent. Expect a hat trick tonight. This is from a toffee too. Usman Ally: Rodgers' ineptitude with the defense never ceases to amaze. Where is Sakho? Not even in the squad. Sadly, he'll be gone soon. It is the first time 'You'll Never Walk alone' is ringing out at Anfield this season. No matter what your team is, seeing thousands and thousands of fans singing, waving flags and holding aloft scarves is one of the great sights in English football. The teams are in the tunnel. How will the Bournemouth players handle this atmosphere? We have three teams - Manchester City, Leicester City and Manchester United - with two wins from their opening two Premier League matches. Liverpool could join them if they get the three points at Anfield. A win by six goals takes Liverpool top. Although it doesn't mean anything in August, it's always nice to boast to your work mates or school friends about it. Tony Needham: As a Pompey fan there has been too many to list! Struan: Seeing my team Hibs being beaten 5-1 in the Scottish Cup final by our biggest rivals Hearts. James Davies: Cardiff getting beaten by Blackpool in the 2010 Play Off final. Liverpool manager Brendan Rodgers, speaking to Sky Sports : "It took us until October last season to get two consecutive wins so the aim is to kick on from Stoke. "The performances will come, the most important thing at this stage is picking up points and wins. Eddie Howe has done a fantastic job for Bournemouth. They will come here with confidence." We are approaching kick-off, so just before we get under way you have enough time to play around with our latest toy - My Premier League Life. You can find out more statistics then you could dream of so go on, have a go. I wonder what's going through this young manager's mind. What a way to begin your travels in the Premier League. Eddie Howe, who took Bournemouth up from League One to the Premier League, will have dreamed of this moment and his heart must be racing, although he will obviously try not to show that. Will the reality live up to the dream? We will soon find out. New season, new captain....as the Independent's chief sportswriter points out. It is going to be strange seeing Liverpool running out at Anfield without Steven Gerrard leading them out on to the pitch. Bola Akinola: I honestly think Firmino should be starting ahead of Lallana. Firmino is a specialist in assists. Matt Jones: I'm torn, I want Bournemouth to win but want Benteke to score as he's in my FF team. Matt Harding: Is Danny Ings going to be this season's Rickie Lambert? Liverpool defender Joe Gomez' physicality was his outstanding trait as a youth player at Charlton Athletic, according to his former captain. Gomez, who at 18 has already forced himself into the Liverpool team, apparently had the physique of an adult from an early age. He left Charlton this summer for £3.5m and his former captain Johnnie Jackson sang sing his praises. "He had the physique of a 26-year-old at 17." Jackson told Mark Chapman on 5 live Sport. "He's unbelievably quick and strong. For a 17-year-old I hadn't seen someone that developed and ahead of their time for quite a while." Listen to the full interview on 5 live's In Short clip. Another new signing at Anfield is full-back Joe Gomez, who helped the Reds keep a clean sheet on an impressive debut as Liverpool beat Stoke 1-0 on Sunday. While Liverpool can afford to spend £32.5m on Christian Benteke, Eddie Howe is having to set his sights a little less optimistically. "Big reception from The Kop as this new-look Liverpool come out to warm up. Christian Benteke - the most expensive signing at £32.5m from Aston Villa - will have a major responsibility to provide the added goals Liverpool will need to mount a challenge for a place in the top four. "The addition of a powerful target man, although he offers plenty of other qualities, is perhaps proof manager Brendan Rodgers is happier to vary his approach than many suggest." The Liverpool players are leaping and springing about as they go through their warm-up routine on a bright and sunny evening at Anfield. The pitch looks perfect, but then again it should be - it's the first home game of the season. Away from the Premier League for just a minute. Everyone likes a bit of showboating. Right? Well, maybe not everyone. Disrespectful or great skill that should be encouraged? We have a video on our site which is well worth a watch of a great bit of skill from Rangers loan signing Nathan Oduwa, who showed his talents during the closing stages of his side's 5-1 Scottish Championship win against Alloa. But Rangers boss Mark Warburton was not too impressed. "I'm not always a big fan of that," he said. Ian Perkins: 3rd May 1997. Hereford United v Brighton. One of us was staying up. One of us was going out of the league. Hereford 1-0 up with 28 minutes remaining. Brighton equalised and stayed up. Hereford consigned to non league. Utter despair. Ric Jones: Sitting in a meeting of fellow Altrincham fans, suddenly realising that the club fold in a matter of days due to the chairman putting club up for sale and giving only a few days to find a buyer, as well as calling in all his 'loans' to the club. Came only a few years after Altrincham went to Birmingham in the FA Cup and beat them. Shane Hagan: right now as a Sunderland fan! Bournemouth boss Eddie Howe, speaking to Sky Sports, says: “It is always about how we perform. We have prepared well for this game, we've had nine days so it is a long time. “We have to do what we do better. It will be a stern test, a challenge we can hopefully rise to and get a result. “It is just another match for us. It is obviously important but we can't hype it up to be bigger than it is. But the club have also been busy off the field. The wife of Liverpool owner John W Henry has been checking out the view at the top of the new main stand at Anfield. And what's that in the distance? None other than Goodison Park, home to Liverpool's Merseyside rivals. There is some optimism at Anfield that they could return to the top four this season and reclaim a Champions League spot. There have been plenty of new faces joining the club. And tonight is the first opportunity for the home fans to witness their new stars. Danny Ings was an unused substitute in the 1-0 win at Stoke on Sunday so will we see him in action today? The home fans could also witness the much-anticipated debut of Divock Origi. The 20-year-old Belgium striker joined the Reds in 2014 for £10m before returning immediately to Lille where he spent the season on loan. Like Ings, he remained on the bench at the Britannia Stadium and could make his debut tonight. Kathy in Kernow: I support Torquay United. Enough said. Jordan Speers: Liverpool failing to win the league in 2014. Was a great season but was absolutely gutted when we didn't win it. Woz Ingham: Mark Hughes equalising in the last second of extra time in the FA Cup semi final 1994,Oldham's season ended after that. What a weekend of Premier League football. We had Manchester City embarrassing Jose Mourinho's champions Chelsea 3-0, Spurs being, well, Spurs and throwing away a two-goal lead, while Southampton and Sunderland both conceded three goals at home. Want to watch a little video from Match of the Day 3 looking at the analysis, stars and funnies from the weekend. Of course you do. Well, go ahead. Sit back and enjoy. While Bournemouth look set to opt for a 4-4-2 formation with two changes from the side that lost 1-0 at home to Aston Villa on 8 August - Eunan O'Kane and Max Gradel in for Dan Gosling and Marc Pugh. Left-back Tyrone Mings, an £8m summer signing from Ipswich Town, remains on the bench for the second game running. Centre-half Sylvain Distin is also on the substitutes bench following his free transfer move to the south coast side from Everton. Will Benteke score his first Premier League goal for Liverpool tonight? This stat suggests he may well be the one to punt for if you're betting on a goalscorer. As the eagle-eyed among you have probably spotted, we have a vote running and it is a very simple one. We want you to tell us who the top goalscorer in the Premier League is going to be this season. If you don't like any of these seven players then we also have an 'other' option for everyone else. The vote will be open until 22:00 BST and we will tell you the winners shortly afterwards. Liverpool: Mignolet, Clyne, Lovren, Skrtel, Gomez, Henderson, Milner, Coutinho, Lallana, Ibe, Benteke. Subs: Bogdan, Toure, Firmino, Moreno, Can, Origi, Ings. SJC: Wales 0 - Russia 1 Euro 2004 playoff. Cried my eyes out. Will Malcolm: Turning up to Grimsby in 2002 twenty mins late and palace were already 2-0 down. Lost 5-2. Well Brendan Rodgers clearly rates Adam Lallana higher than the programme editor does. Lallana starts as Liverpool are unchanged from the side that beat Stoke. Two changes for Bournemouth with Eunan O'Kane and Max Gradel starting in place of Dan Gosling and Marc Pugh. "Hope Brendan Rodgers is not trying to tell Adam Lallana something. His name has been left off tonight's programme list of Liverpool's squad - purely an oversight of course but it would be a new way of dropping the hint. Lallana's number 20 is normally sandwiched between Alberto Moreno and Lucas but it is nowhere to be seen. "Liverpool co-owners John W.Henry and Tom Werner have just surveyed their Anfield empire from the directors' box - with the giant steel structure of the new Main Stand that is under construction of particular interest." Are you better than Lawro? Can you do better than Lawro? Well, let's see what you're made of. Our Premier League Predictions game is up and running so get your thinking caps on and make your predictions for tonight's match. Each week our pundit Mark Lawrenson predicts the results of the Premier League matches. He also has a challenger, this week it is the turn of BBC Radio 6 Music presenter Mark Radcliffe. Nether man has got a perfect score right so far in this round of fixtures, although Lawro has five results going the right way, compared to four from Radcliffe. But neither person gives the Cherries any hope at Anfield. Anthony: Crying on the tele after losing in the play offs in 2009. Skip: 8 August 2009, after being relegated to League One Colchester came to Carrow Road on the opening day and stuffed us 7-1 . Ryan: When Gillingham got relegated on the final day of the 2009/10 season with 50 points. Tweet us using the hashtag #bbcfootball, text us on 81111 or leave a message on the Match of the Day Facebook page. So Bournemouth have never beaten Liverpool and the Cherries have no chance at Anfield then. Right? Certainly not if you believe Bournemouth midfielder Dan Gosling. Tonight is the first league meeting between the two sides, although they have played each other in both of the last two seasons. Liverpool won 3-1 in the League Cup quarter-final last season and 2-0 in the fourth round of the FA Cup in 2013-14. Bournemouth are desperate to prove their critics wrong and surprise people this season. They won the Championship title in 2014-15, but made a losing start to their Premier League campaign as they were beaten 1-0 at home by Aston Villa. For Liverpool, though, a moment of magic from Philippe Coutinho saw them begin with a 1-0 win at Stoke City on Sunday. Rob Meech: As a Bournemouth fan, my lowest point was being on the verge of extinction. My highest point is now. So you have heard about Bournemouth's struggles and that ties in with our chat for tonight. We want to know what has been your lowest point as a football fan? You know the drill. Tweet us using the hashtag #bbcfootball, text us on 81111 or leave a message on the Match of the Day Facebook page. Don't be shy, we will put the best messages on this page. Also, are you at the game? If so, tweet us your pictures and we will throw those in as well. Not even the most optimistic Bournemouth fan could have predicted their club's turnaround in the last seven years. In 2008 the club entered administration for a second time in 11 years. "There was one press conference at 12 o'clock when, at five to 12, I didn't know if I had the money to continue trading," recalled administrator Gerald Krasner. "I came within five minutes of liquidating the club." But that was not the end of the trouble. The following season, hit by a 17-point transfer deduction and a transfer embargo, the Cherries faced relegation until they won their last three matches to stay up. A league game at Anfield seems a whole world away. Hello and welcome to BBC Sport's live text commentary for tonight's Premier League match between Liverpool and Bournemouth, who are playing their first ever away game in the top flight. Seven years ago, Bournemouth were broke, desperate and five minutes away from going out of business. A year later, they needed a goal in the last 10 minutes of the penultimate game of the season to stay in the Football League. But in one of football's greatest fairy tales, the club not only survived, but they prospered. Guided by manager Eddie Howe they have made it to the big time. Today they play at one of the best stadiums in the country against one of the best-known teams in Europe. It has been one crazy ride.